God and Satan debate the futures of three poor sinners. Dir: John Carr Cast: John Phillip Law , Cameron Mitchell , Marc Lawrence . "The film is often compared to the likes of Plan 9 From Outer Space due to its bad dialogue, poor editing, and numerous continuity errors." A stray cat becomes involved in three tales of horror. Dir: Lewis Teague Cast: Drew Barrymore , James Woods , Kenneth Mcmillan . Scientists at a remote desert base discover that ants are preparing to conquer the world. 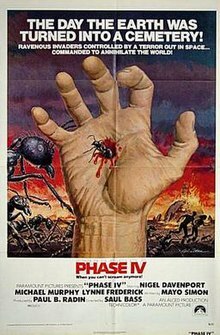 Dir: Saul Bass Cast: Nigel Davenport , Michael Murphy , Lynne Frederick . "....not a conventional sci-fi film and will not conform to the genre conventions that you expect, you may find it absolutely chilling and brilliant." Dir: Alfred Sole Cast: Linda Miller , Mildred Clinton , Paula Sheppard . Yeah, I seem to recall that it was pulled at the last minute when it was scheduled before. And it was replaced by what...? Equinox (1970), maybe? I think that was it. A priest fights to defeat a demon that has taken over his church. Dir: Michele Soavi Cast: Tomas Arana , Hugh Quarshie , Asia Argento . Allmovie called it a "gothic-drenched apocalyptic nightmare" that builds "a suffocating sense of quiet dread". A wealthy musician buys a sleeping woman from a carnival but gets a surprise when she awakens. 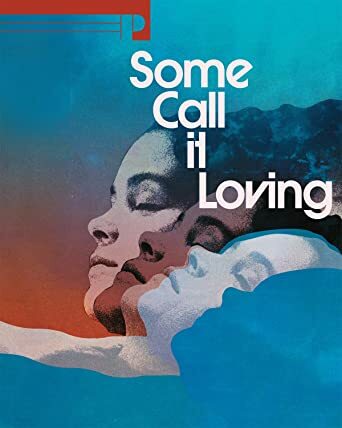 Dir: James B. Harris Cast: Zalman King , Carol White , Tisa Farrow . I recorded this mostly to see what Bass would do with live action. I couldn't get into it in the first 10 minutes. Did anyone watch this? Does it get better (or even funnier) as it goes along? Where are the Satellite of Love guys when you need them? Saul Bass being the Director... he focused more on visual presentations rather than story. You have to be a little more on the geeky side to appreciate it's offerings. Synopsis: A Vietnam vet uses samurai training to fight the mob. Dir: Cirio H. Santiago Cast: James Monroe Iglehart , Carmen Argenziano , Leon Isaac . Synopsis: An ex-soldier is recruited by the FBI to go undercover in L.A. and find other ex-soldiers who are part of a drug-dealing gang. Dir: Tom Stern Cast: Telly Savalas , Robert Vaughn , John Marley . Two black bounty hunters sign on as sheriffs for a small Western town. Dir: Jack Arnold Cast: Fred Williamson , D'Urville Martin , R. G. Armstrong . Vincent Canby: "Most black Westerns either ignore race or make it the fundamental point of the movie. Boss **** somehow manages to do both quite successfully." Synopsis: Dracula's canine and human servants travel to the U.S. in search of his descendants. Dir: Albert Band Cast: Jose Ferrer , Michael Pataki , Jan Shutan . "Adam Tyner of DVD Talk rated it 2/5 stars and wrote that the film is too inept to be scary, though it is fun to mock." Synopsis: Abandoned dogs join together to take on human enemies. Dir: Robert Clouse Cast: Joe Don Baker , Hope Alexander-Willis , Richard B. Shull . "Variety gave the film a positive review, writing, "The Pack is a well-made and discreetly violent story of a pack of wild dogs menacing residents of a remote island." I still clearly recall watching both of those at my local Drive-In Theater! 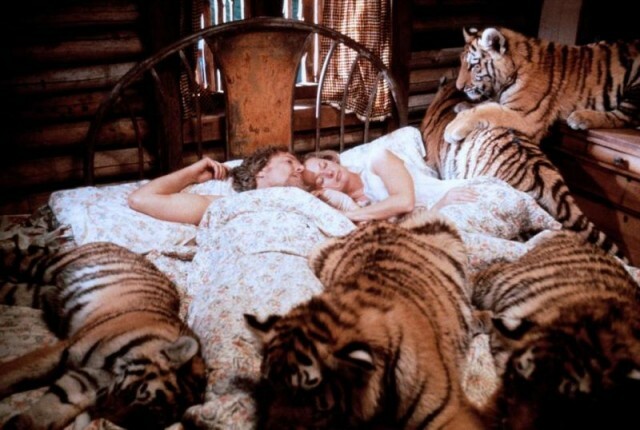 Synopsis: An environmentalist's estranged family discovers his African home overrun with wild animals. Dir: Noel Marshall Cast: Tippi Hedren , Melanie Griffith , Noel Marshall . Dir: Tom Hanson Cast: Hal Reed , Bob Jones , Ray Lynch . Punk rockers invade a small town. Dir: Stanley Lewis Cast: Sandra Bogan , Stephen Falchi , Roxanne Rogers . A deranged killer stalks a sorority hazing party. Dir: William Fruet Cast: Martin Hewitt , Ralph Seymour , Elaine Wilkes . They could be campy fun time capsules (like FRIGHT NIGHT/R&R HIGH SCHOOL) or simply dreadful bores. If anyone has an opinion, let me know. I haven't seen either yet, Tiki, but I'm planning on recording them both. I've heard of Killer Party, and it's on DVD from Warner Archives. I had never heard of Punk Vacation until it was on the schedule. My educated guess would be that they are both probably dreadful. Thanks for your input Lawrence. If they turn out to be great, I'll just see them when TCM repeats them. In the meantime, I can catch the routine schlock on COMET. Last night I was mesmerized with 1992's dreadful HIGHWAY TO HELL. You don't even need to see these movies in their entirety to enjoy the pomposity. Highlight (but didn't understand) was a scene with about a hundred vintage VW Beetles driving across a desert flat shot from above! Bet the producer was a member of a Beetle collector club. Man, there was just a plethora of awful teen "scary" movies in the 80's & 90's. And they are very popular with Gen X & younger horror fans! If you watch a few of those 80's teen slasher/horror films in a row, you realize that they just kept making the same movie over and over again, with the faces changing (barely). I remember Highway to Hell. It had demonic highway patrolmen with mirror-shades bolted onto their faces and symbols carved into the skin of their faces. Those guys and the VW armada in the desert are about the only things I recall. Have there been no TCM Underground premieres since November? Have they just given up on bringing new titles in? Underground seems like it would be the easiest schedule to program for. Lawrence--Check "TCM Premieres" thread in "General Discussions"--"Terminal Island" (1973) is an "Underground" premiere. Oh, okay. This thread just stopped being updated? I thought a few this month might have been premieres. I wasn't sure if Penitentiary had been shown before. The Hidden and The Terminal Man next week, and Scanners the week after. I've seen them all, so maybe that's why I'm disappointed, although I highly recommend a couple of them (The Hidden & Scanners) for those who haven't seen them. Frankly, I kinda lost interest in much of the new 'Underground' film programming. Just not to my interest. I'll keep posting them, when possible, in the 'Premieres' thread though. -but then NOthing's perfect, Right? ?